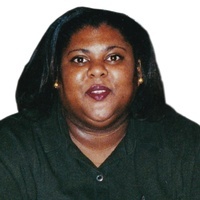 Tonya Yvette Bolden Jackson, 50, passed away Thursday, January 10, 2019 at the John F Keever Solace Center. A native of Asheville, she entered this life on September 3, 1968. Tonya graduated from Asheville High School, Class of 1986. She attended UNC Greensboro and later graduated from Asheville Buncombe Technical College on August 25, 1989 as a Licensed Pratical Nurse. Tonya found great satisfaction and enjoyment in caring for others. She was a faithful member of Kingdom Hall of Jehovah's Witnesses, South Congregation. In addition to her husband, Flavious H. Jackson, Jr. who died October 29, 2018, she was preceded in death by her maternal grandparents, Harding and Mildred Bolden, Sr.; uncle, Harding Bolden, Jr.; father-in-law, Flavious Jackson, Sr.
Left to cherish her memory are her parents, Joe Nathan and Viola Bolden-Jones; step-daughter, Brittany Smith (Reginald); step-brother, Joe Nathan Jones, Jr. Washington, DC; step-sister, LaTeisha Royster (Jason) Snellville, GA; sister, Darien Jones; mother-in-law, Donna Jackson Barnard; sisters-in-law, Delia Landing (Laurett), Monica Mitchell (Robert) Atlanta, GA; seven nieces and nephews; devoted and cherished aunt, Cynthia DeVerger (Derrick) Asheville; several aunts, uncles, cousins; other relatives and friends. The family acknowledges with sincere appreciation, love and friendship to Gwendolyn Taye for her dedication and support of their loved one. Special thanks to Dr. Linh Dastous, Palliative Care and the Intensive Care Unit of AdventHealth, Fletcher, NC. ; Dr. Frank Laughlin and the team of the Stinkney Wing of the John F. Keever Solace Center for their love, support and care of Tonya.